The Vanguard Endeavor scope boasts features found on competitive optics costing hundreds more, including multiple reflective coatings and HOYA ED glass for a clear and crisp view, and comes with a Bullet Drop Compensation reticle. 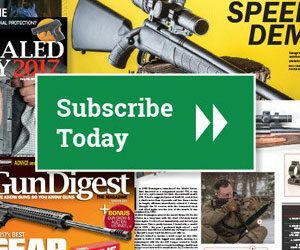 Add on the Gun Digest Book of Long-Range Shooting and Sniper Shooting Basics, both offering tips and technical teachings to improve your technique, and you have a collection that will really help your long-distance accuracy. Save $128 on retail with this collection! If you’re a fan of Col. Jeff Cooper’s bolt-action brainchild, Leupold’s VX-R Scout FireDot scout scope may be just the ticket. One rifle to do it all. Fighting. Hunting. Surviving. That was Col. Jeff Cooper’s vision when he started conceptualizing the scout rifle platform in the late 1960s. According to Richard Mann, my friend and author of the upcoming book, “The Scout Rifle Study,” Cooper’s project all started when he mounted an extended eye relief scope to his Remington Model 600. “For the next 30 years, he tried to improve on the concept by working with a number of custom scout creations,” Mann explained. Since its inception, a handful of gun manufacturers have tried to breathe life into Cooper’s concept. It’s been closely replicated by some, bastardized by others. It seems a hefty majority of scout rifle experts, such as Mann, argue that Steyr built the truest form of the scout. An authentic scout rifle sports a handful of very specific attributes, including but definitely not limited to: a maximum weight of 6.6-7.7 pounds and length of 1 meter; a magazine-fed bolt-action chambered in .308 Win. ; plus, a sighting system with iron sights and, ideally, a forward-mounted scope with low magnification. All in all, it’s meant to be a general-purpose rifle that could serve you under a wide variety of circumstances if it were the only rifle in your arsenal. But the point of this article isn’t to pontificate about the ins and outs of scout rifles—if you want that, get Mann’s book when it’s published in early 2016. Rather, I’m here to offer my review of a particular all-American optic from Leupold that’s designed for the scout rifle platform. So let’s get to it. What makes a scope suitable for a scout rifle? Extended eye relief, low magnification and minimal weight are all key criteria. That’s how I’ll first evaluate the VX-R Scout FireDot riflescope from Leupold, mounted atop my Ruger Gunsite Scout Rifle (GSR). The Duplex reticle is designed for simplistic utility. Combined with Leupold’s illuminated FireDot, it’s ideal for rapid target acquisition and accurate snap shooting. The most important scout scope characteristic is that it must offer plenty of eye relief, because it needs to be mounted in front of the rifle’s ejection port. The scope must not interfere with ejection of spent cartridges, nor prevent efficient manual reloading of single cartridges directly into the chamber. Additionally, Cooper felt long eye relief gives the shooter better peripheral vision for situational awareness. These traits are desirable for battle and hunting applications—an impending threat can come from where you least expect it, and so can a big, meaty buck while you’re so intently focused on the tender backstraps of a smaller doe. According to Leupold, at the peak allowance of its adjustable-focus eyepiece, the VX-R Scout FireDot offers an eye relief of approximately 6 inches at its lowest magnification (1.8x actual) and 7 inches at its highest magnification (4.7x actual). With a comfortable, natural cheek weld on my GSR, a quick measurement from my dominant eye to the ocular lens found those numbers to be accurate. This scope barely misses the mark by about 2 inches if you want to mount it forward of the GSR’s ejection port and still achieve its full field-of-view at all magnification levels. If you cheat it just slightly, you can mount the scope in Cooper’s proper position and you’ll still get a respectable viewing window. Speaking of field-of-view, this scope won’t let you miss much activity downrange. At its lowest magnification, you’ll get a 43-foot FOV at 100 yards. Zoom-in to 5x and your view will span 17 feet from right to left at the end of a football field. Leupold didn’t miss the mark when it comes to magnification levels baked into the VX-R FireDot. Cooper fancied a low-magnification, fixed-power scope with less than 4x zoom. This Leupold is 1.5-5x, making it ideal for close-quarters action or long-range pokes. Sure, it goes one notch above 4x, but who’s complaining about that? Personally, I do more hunting than gun fighting, and I’m hoping to keep it that way. Without getting too outlandish, I’ve appreciated the benefits of some extra magnification more times than I can count—and so have the animals that died quicker deaths because of better precision on my end. Leupold’s VX-R FireDot riflescope contains 1/4-MOA windage and elevation adjustments. Every click is audible and easily felt. Now is a good time to mention the FireDot part of this riflescope. The FireDot is Leupold’s proprietary illuminated red dot. It turns on and delivers adjustable illumination levels with the press of a button. In this scout scope, you can choose to light up the dot in the center of the black Duplex reticle, or just leave the reticle unlit. The main benefit of the FireDot, especially fitting for a scout rifle, is rapid target acquisition and faster snap shooting. However, if the you-know-what hits the fan and you’re stuck in a compound with diminishing supplies, you might run out of batteries to power the FireDot. But no worries—you’ll always have the trusty Duplex reticle at your disposal. An auto-off feature will shut down the FireDot after 5 minutes of rest, but it’ll fire back up immediately when you shoulder your rifle. How about overall optical quality and low-light visibility? Like most other Leupold optics, the glass is great. Colors are true, edge-to-edge clarity is excellent, and the eye is generally pleased by this riflescope. When the sun goes down and a certain antlered beast shows up on the fringe of legal shooting light, you can count on seeing his vitals out to 100 yards or more. God forbid you need to defend your castle and remove threats under ambient city lights, but this scope will allow you to do so at even longer distances of 200-300 yards with shocking accuracy. The VX-R FireDot is at the top end of the scale for a scout scope. It weighs 14.2 ounces. Combined with the 7.1-pound GSR, that brings my scout setup to about 8 pounds. Yep, it’s overweight, but the primary culprit here is the rifle—not the ultra-durable Gold Ring optic. Ruger’s composite GSR shaves off another pound and, like its laminate older brother, it’s a shooter. I’ve fired both versions, and with the right ammo (Federal’s Trophy Bonded Tip), they’re MOA or even sub-MOA rifles from the bench. But a pound lost still doesn’t bring it under Cooper’s 6.6-pound ideal weight, and that’s not even including the mandatory sling or other accessories. All these grueling details bring me to my bottom line. I think Col. Cooper’s scout rifle concept is sensible, attractive and downright responsible. Every responsible citizen should own a general-purpose rifle, and that’s why I always will. And if you own one, it ought to have good glass on it. Every great concept needs underlying standards, but there’s always room for personal deviation for sinners like me. Stick to the underlying principles of Cooper’s scout—and a reliable optic to match—and it’ll be your first choice in a rifle when it’s time to bug out. The whole “scout rifle” forward mounted optic concept was based on being able to use stripper clips for faster reloads. That aspect is generally moot with all of the DBM bolt rifles on the market now days. Trying to find a modern rifle cut for stripper clips is way more challenging than finding a scope you can use for that pattern rifle! Every thing else about Coopers concept is doable with this rifle. They also did not have the plethora of true 1x variable optics available that we are blessed with today! It was a concept, based on being able to accomplish a set of well defined capabilities, not a carved in stone bible verse from the All Mighty.